One of many researches has shown that people with weak external and strong internal motivation achieved better success than the ones having high external motivation levels. Apparently, genuine interest and ambitions guide the person better than a will to get rich and famous. Of course, no one says that external validation does not work completely—but the fact remains: internal just works better. In the 21st century, the carrot-and-stick motivation to do work well and get rewarded is not enough in many cases, as you have to take higher risks and create something in more cases than not. Having a higher purpose other than money or grades yields more productive results. It’s quite a logical yet pretty boring question at many job interviews that do not require just simple rewarded tasks but rather critical thinking. 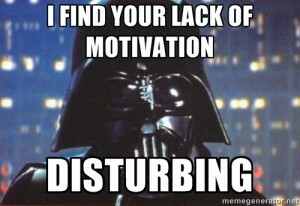 “Why did you choose this job?” If you have motivation other than money, you would be more likely to do your job better. Anyway, to produce better results in your work not only at the moment but also long-term, use these tips to help you. Think of how this activity will make you a better person. Studying, for example, will expand your horizons. Improve your mental abilities. Make you more erudite. It will teach you how to perform different tasks, and not only this—you may use all these newly found superpowers to make the world a better place by conducting some new research or improve people’s life. Track your improvements and achieve your personal best. Yeah, I bet you’ve heard this before, but it really works. Put small goals and achieve them, and take a note every time you do this. There are few things in this world that feel as good as personal development. Keep your goal in mind and work for a greater good. Do not just focus on money or grades. When you achieve this goal, you may be overcome with a sense of emptiness: now what? Choose something more generalized: improve the environment or create something beautiful, and that’s why I need to do what I’m currently doing. Studying together usually yields better results for all the parties involved: you may both help and be helped when learning some concepts, and explaining someone a theory will allow you to memorize it. In some cases, competing in a class can also make you more motivated. Even if you hate studying this particular subject or reading this textbook, this little trick can help: turn on your favorite music or eat something that you really like when solving the tasks. It will make the experience a bit better. Just don’t get carried away and drool every time you hear “macroeconomics”. When getting ready to study, say to yourself, “I am choosing to do this task. I have a freedom to do it and I will” instead of “Ugh, the teacher will kill me if I don’t do it”. You’re free to choose to become educated. All you have to deal with is consequences, but the thing is you can choose these consequences. Do not limit yourself. Try something new – maybe some new techniques, or new approaches. Keep thinking of how you can make things better, and tell yourself than you are capable of it.